At The Carpet Store and More we carry the widest selection of vinyls. If you’re looking for an easy-care surface you will find it here! No other floor covering offers the variety of colours and patterns as vinyl flooring. Thanks to some great advancements in styling and technology, today’s vinyl floors have been changed forever. 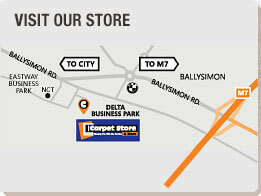 Here at The Carpet Store and More, we carry the widest selection and biggest brands. If you’re looking for an easy-care surface, you’ve found it! Call in today and we will answer any of your questions on commercial vinyls.